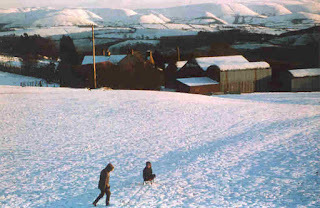 As I sit here at my desk on this cold and grey January afternoon, with the first light snow of winter gently falling outside the window, I find my mind being drawn back to another snowfall, thirty years ago this month. However, this was no thin covering like today, but the most severe blizzard I can remember in my sixty-five years of life. 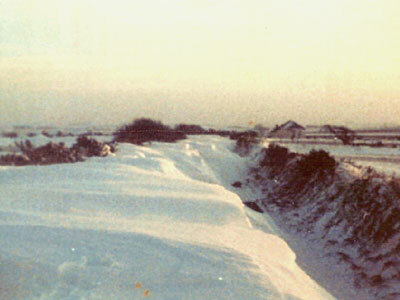 December 1981 had been exceptionally cold and snowy, one of the worst Decembers I can recall. I remember it so clearly because at that time we were living in conditions not much better than a building site, as our decrepit old farmhouse was gradually renovated around us. The roof was in the process of being replaced, as were the windows, and I will never forget the fortitude of the double-glazing fitters, as they struggled to install our new aluminium-framed windows in the middle of a record-breaking cold spell. 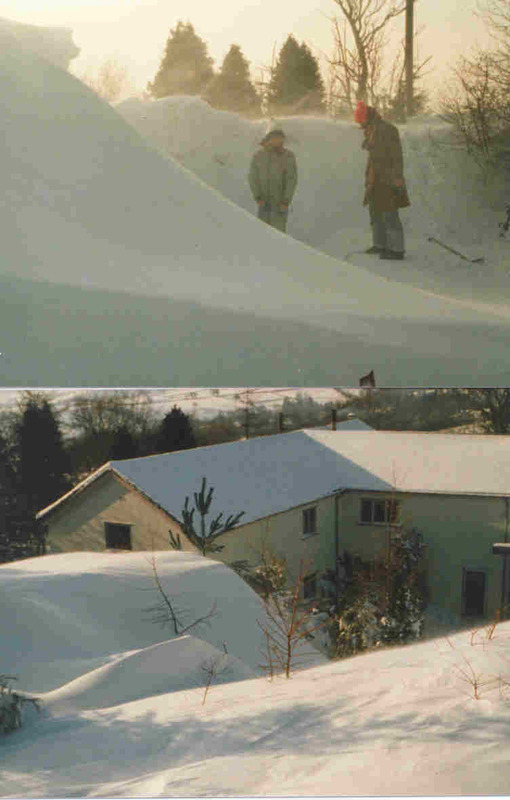 Towards the end of the month, with snow still lying thickly on the ground, we went away to spend the Christmas holidays with DH’s recently-widowed mother, and arrived home in Wales at the beginning of January. DH and I went back to work and the children to school, and fortuitously, as it turned out, I made a point of stocking up the larder and the fridge as soon as I went into town. That was on Tuesday, market day in the little town where I worked, and two days later, on the night of January 7th 1982, the snow began to fall. It fell all night, and by the time we woke up on Friday morning it was obvious we weren’t going to be going anywhere anytime soon. All day we stayed indoors, watching as the snow continued to fall without stopping, and it was still falling when we went to bed that night. 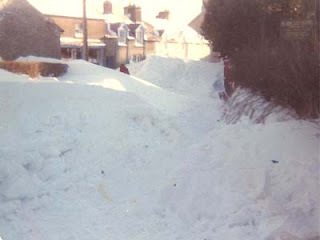 It wasn’t until well into Saturday morning that it finally stopped and by that time we had around two feet of level snow everywhere and drifts that filled our lane from hedge-top to hedge-top. In those days we had no television, so our only source of news was the radio, and we listened avidly to every news bulletin we could find. 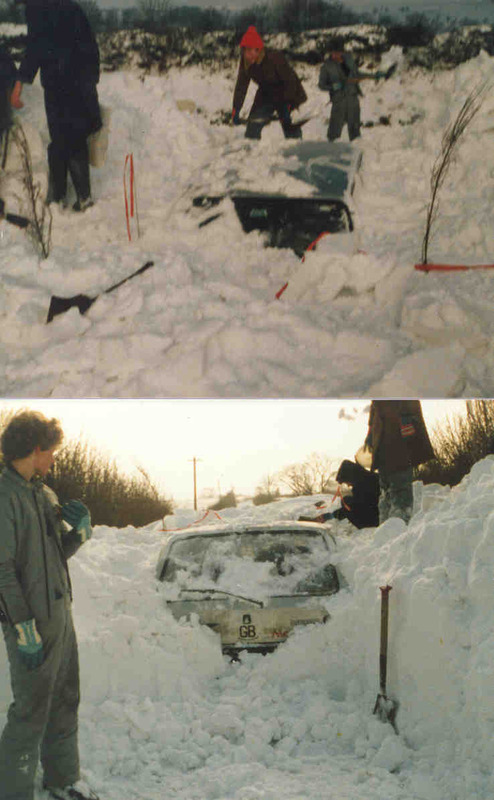 We discovered at once that this had been no local blizzard, but a very widespread and severe weather event, which had virtually paralysed the southern half of Britain. For days our village was cut off from the outside world, and even when the first snow-ploughs had cut through the worst of the drifts, only four-wheel drive vehicles could cope. We live on the 1000’ contour line, nearly two miles up a steep hill from the centre of the village , and it was at least a week after the snow stopped falling before the first snow-plough went along the single-track county road at the end of our lane. We knew that we would almost certainly have to clear our lane ourselves before we could get our vehicles out. Once the plough had been through we asked a local contractor to try clearing it for us with his digger, but the lane was too narrow for him to be able to manoeuvre properly. It was at this point that DS, then newly a teenager, and with a teenager’s urgent need for extra pocket money, volunteered to dig out the lane if we would give him what we would have paid the contractor. Naturally expecting that his enthusiasm would soon wane and our money would be safe, DH and I readily agreed and found him a snow shovel. The weather was beautiful, if very cold, and the sun shone day after day from a cloudless blue sky. DS wrapped up warmly and set to work. And how he worked! He persevered valiantly all through the first day and by the time dusk fell had definitely made an impression on the 5 to 6 foot drifts which filled the lane. But it was obvious that it would take him far too long to finish the whole 150 yard stretch which needed to be cleared, even if he could find the energy. We would all have to help. Next morning all four of us set to work, two at each end of the lane and dug towards each other for the best part of the next two days, until finally, like explorers meeting in the wilderness, we broke through the last few feet and finally had a gap wide enough for our small cars to pass. Note about images These were not all taken at the time of the great blizzard, but in winters around that period. They give a good impression of the kind of drifts we often had to deal with back then. The staff of life or the stuff of nightmare? Last August, not long before our return from France, the Transit household was plunged into mourning by the demise of one of my most faithful helpers, my bread-maker. After ten years of faultless service, my trusty little Breville Baker’s Oven had developed an unmendable leak in its pan, and we couldn’t replace it, as the model had been discontinued. I spent hours scouring the internet, just in case a stray one might still be on offer somewhere, but to no avail. 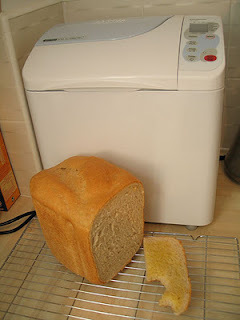 Unless I wanted to start making all our bread by hand, I had no option but to buy a new machine. Now the purists among you might wonder why I didn’t opt for the first possibility and make bread from scratch. I can forgive the question, because you couldn’t possibly know of the struggles I went through 30 years ago, as I attempted to make consistently edible bread by hand. I tried different recipes, different flours, even different methods, but more often than not my loaves still came out of the oven resembling slightly flexible house-bricks, but bricks we couldn’t afford to throw out. 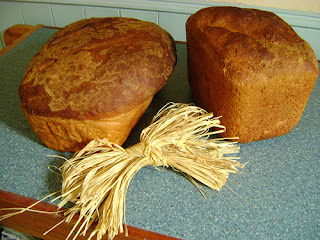 So it was that our first bread-maker came to live with us and life changed for ever. It was a Hinari and its tiny recipe book was filled with recipes that worked every time. I wouldn’t like to try to calculate how many loaves it made for us before it finally expired, but we had it for some 14 years, so it must have been a lot. Sadly we couldn’t replace it with the same model, which is how we came to buy my beloved Baker’s Oven. Now, after much research, and not being willing to break the bank for a machine that does everything but slice the bread for you, I have a shiny new bread-maker, but things just aren’t the same. Don’t get me wrong. It’s a nice machine and can make beautiful bread if it tries, but I honestly don’t think it tries hard enough. Sad to say, it’s a machine with attitude, a temperamental bread-maker, liable to throw a hissy fit if the ingredients aren’t measured completely accurately, and sometimes even when they are. At the moment DH and I are valiantly chewing our way through something I thought I would never see again in my own kitchen – a slightly flexible house-brick! It tastes great, which is some consolation, but the amount of mastication required to be able to swallow a slice probably more than offsets the calories it contains. The previous loaf I made went to the other extreme and was so crumbly that it almost disintegrated when I tried to slice it. However, the new machine has one saving grace: it makes superb dough. 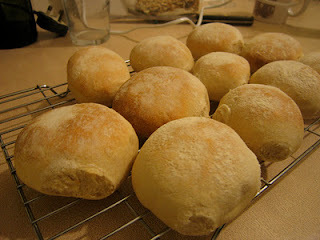 I made rolls last week, using dough it had kneaded for me, and they were wonderful, as they always are. This fact, combined with the recent crumbs versus house-brick contest, has led me to decide on a sneaky but very workable solution. The more observant of my readers may have noticed me saying more than once that I find blogging more interesting and enjoyable than almost anything on TV. I’m glad now that I used that qualifying ‘almost’, because for an hour last Monday (and the previous one) only the direst emergency could have dragged me away from the TV screen. 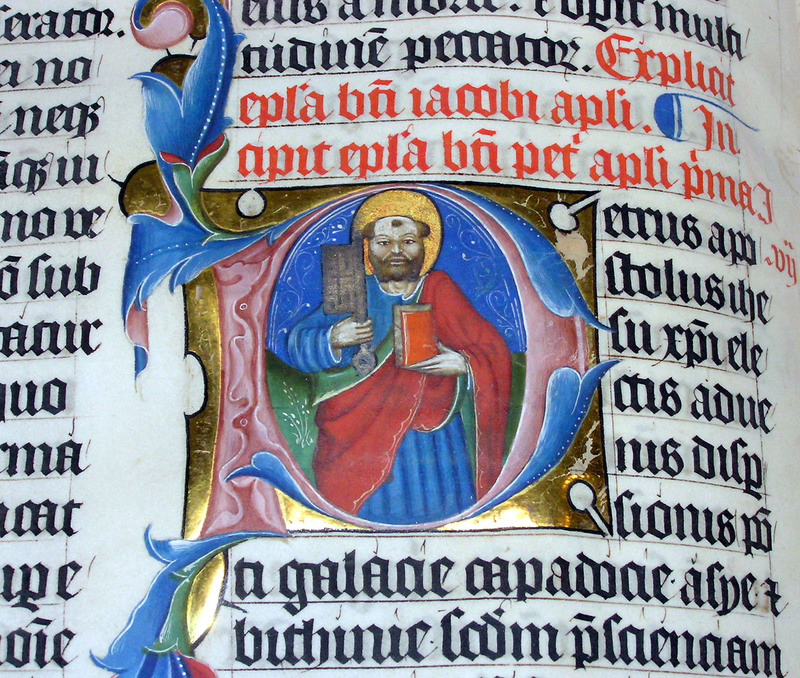 It was by complete chance that particular Monday evening that I switched on the TV to find that BBC4 was about to start a 3-part series on one of my longest-standing passions: mediaeval illuminated manuscripts. 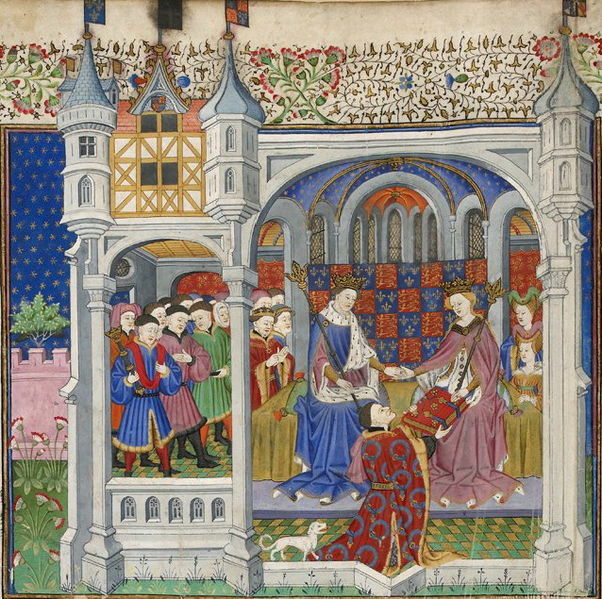 The series is called Illuminations: the Private Lives of Mediaeval Kings and has been made to link in with a new exhibition of royal manuscripts currently being shown at the British Library in London. Each was an hour of pure bliss, as I watched the art historian Dr Janina Ramirez explore the world in which these treasures were made and the reasons for their making. The programmes are so good that we have recorded them for future viewing and I know I will return to them more than once. 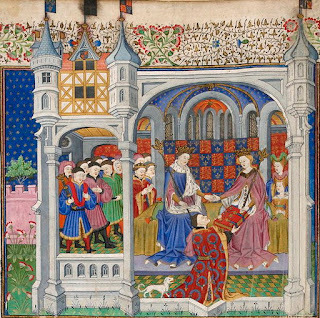 As I watched the first programme I tried to recall when my love of mediaeval and Renaissance architecture, art and, in particular, manuscript illumination began, but couldn't. 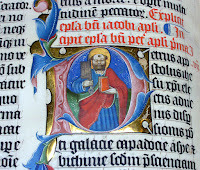 It may have been sparked by the mediaeval German literature I studied as part of my degree course back in the mid-1960s. If so, it lay dormant for the next few years until I qualified as a librarian and began work in a public library, where my immediate superior was an immensely knowledgeable collector of old and often rare books. During our coffee breaks he would sometimes show me book auction catalogues, many of them illustrated with pages from the works on sale. 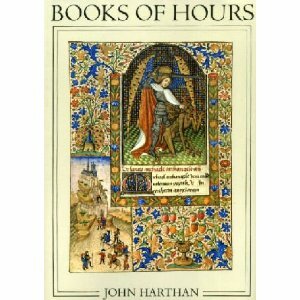 It was in this way that I first learned about Books of Hours and began to read about them and the people for whom they had been made. My own bookshelves tell me that by 1979 my interest had grown to such an extent that my mother gave me a beautifully-illustrated book on the subject as my Christmas present. I spent many hours reading this book and poring over the exquisite detail of the wonderful illuminations, with their jewel-like colours, lavish use of gold-leaf and fascinating glimpses into a world so distant and different from our own. One of the manuscripts examined in the book is the world-famous and immensely richly-decorated Les Très Riches Heures du Duc de Berry. I was so bewitched by the beauty and variety of these illuminations that at Christmas 1985 DH gave me a book about this one unique Book of Hours. 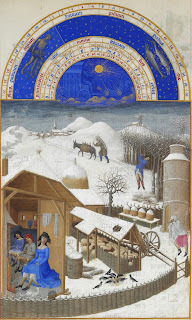 The Très Riches Heures is deservedly famous for its wealth of exquisite sacred images, but above all for its extraordinary calendar of the months. This portrays in loving detail the seasonal life of the countryside of the Berry region and the Duke’s court, from feasting at Christmas to haymaking in June and back again to winter, many of the images enhanced by the amazingly detailed depictions of castles and towns in the background. The book DH gave me consists almost entirely of illustrations, with only the minimum of explanatory text. Next to it on my shelves is another volume, again a gift, this time a gesture of thanks and farewell from my former library colleague and friend, who retired in 1987. 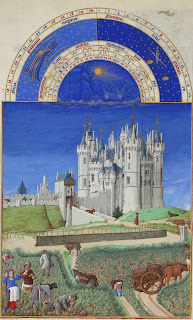 It is another splendidly illustrated book on the Très Riches Heures, but this time complete with a scholarly introduction and a much fuller commentary on the wealth of illustrations. Taking these books off the shelves and looking at them makes me realise how much our interests and passions are bound up with who we are and the relationships that have formed us. Here are three gifts linked to a lasting interest in my life. Three gifts from different people, each of whom knew how much the gift would mean to me, each of whom has contributed, to a greater or lesser extent, to making me the person I am. These three books may stay on my shelves undisturbed for long periods as new interests come to the fore, but once opened again they still transport me instantly into a different world, while at the same providing a tangible link to some of the most important people in my life. Sadly two of the givers are long dead, but the first glimpse of their handwriting on the fly-leaf of their gift makes them live again in the little world of my memory. You don’t have to be a regular reader of my blog to realise that it doesn’t normally do current affairs or news, other than trying occasionally to grapple with the vagaries of Blogger. However today is an exception. I spent much of this morning writing a new post, which involved more research than usual, including looking for suitable images, for which Wikipedia is often a very useful resource. Thus it was that I came across the news that tomorrow (January 18) the English Wikipedia site will be blacked out for 24 hours as part of a worldwide protest at what are seen as attacks on the freedom of the internet. There is a full explanation HERE, and not wanting my readers to be faced with inactive links, my post has been filed until the protest is over. It is salutary to realise that, until faced with its absence for just one day, I, like most people, had come to take the availability of Wikipedia, whenever I need it, entirely for granted. With all its faults and limitations it is a extraordinary compilation of information and images and we bloggers would find life more difficult without it. Thank you, Wikipedia, and long may you flourish unimpeded. One of the many lovely things about this blogging world of ours is being introduced to blogs we might not otherwise come across and finding ourselves very much at home. 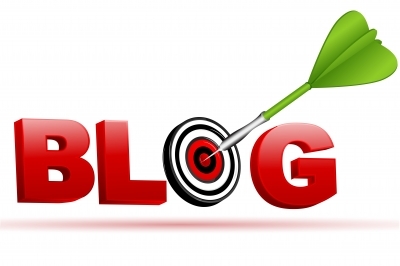 To aid this process of discovery bloggers have become good at handing out awards which involve the recipient in handing them on to other bloggers in their turn. I have to thank the wonderful Ayak at Ayak's Turkish Delight for thinking of me when she was given the Liebster Blog award recently. Unlike some awards the Liebster Blog doesn’t involve any self-revelation (thank goodness), but simply asks the recipient to add its image to their sidebar and, if they wish, to do a post passing it on to five other blogs, specifically blogs with fewer than 200 followers. As we don’t all follow each other’s blogs, it’s probably best to let the new recipients know directly, as well as in the special post, and of course link back to the awarding blog as a gesture of thanks. There are so many wonderful blogs out there, full of good writing, beautiful images and interesting thoughts that it’s difficult to choose just five. However, I’ve taken the plunge and would like to introduce you to five very different and enjoyable blogs I’m glad I found. Blethers is a thoughtful and beautifully-written blog by a retired English teacher and active poet, living on the west coast of Scotland. Lifeonthecutoffs Blog is a recent discovery of mine which I am enjoying enormously. It reflects life in a quiet, rural corner of the American Mid-West, on the very edge of Chicago. Its sharing of favourite books has already tempted me to more book-buying than is probably good for me. Lurking is a delightful mixture of blog and day-book written by someone who lives on the very edge of London and who shares many of my interests, such as books and knitting and church life. 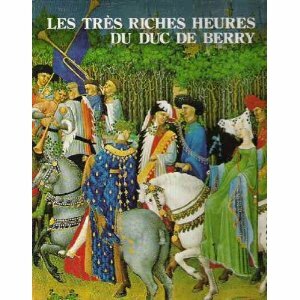 a very grand pressigny is one of two blogs I've chosen with a French flavour. It’s about life with a much-loved second home in the Loire Valley and is spiced with lots of wonderful photos and also some tempting links to recipes on the author’s other blog. Writing Home is a blog about life in rural south-west France – a gentle, beautifully-illustrated portrait of a quiet life of house restoration, gardening and animals, with the occasional recipe thrown in for good measure. I do hope you enjoy exploring my five chosen blogs as much as I've enjoyed choosing them. Today I and some sixty other women, throughout Wales and beyond, are marking a very special anniversary. 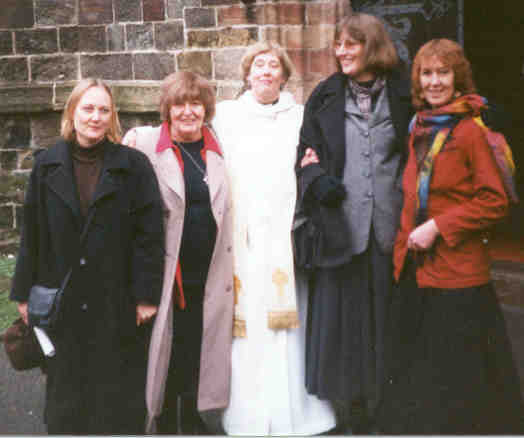 Fifteen years ago today, on January 11th 1997, we became the first women to be ordained to the priesthood in the Anglican Church in Wales. In the six cathedrals of Wales every seat was taken, as our families and congregations packed the pews to witness this solemn, historic, and profoundly joyful occasion. My ordination took place in Bangor Cathedral, in the north-west corner of Wales, on a grey and wintry Saturday just after Epiphany. My entire family had made immense efforts to be there, with DH and our two children, my four sisters, DH’s two brothers, my mother-in-law, and as many assorted partners and children as could make it, coming from all over the UK to support me and rejoice with me. By my reckoning there were 24 of us around the restaurant table for the celebration lunch after the service! In addition, an entire coach-load of local friends and parishioners had travelled almost 100 miles along slow and winding Welsh roads to be there too. That service, and the new ministry which it opened for me and my female colleagues, was the culmination of a long and, at times, very painful process. 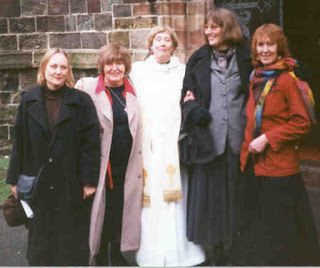 The Church in Wales had been the pioneer of the ordained ministry of women in the Anglican Church in Great Britain, having ordained women as deacons as early as 1980. 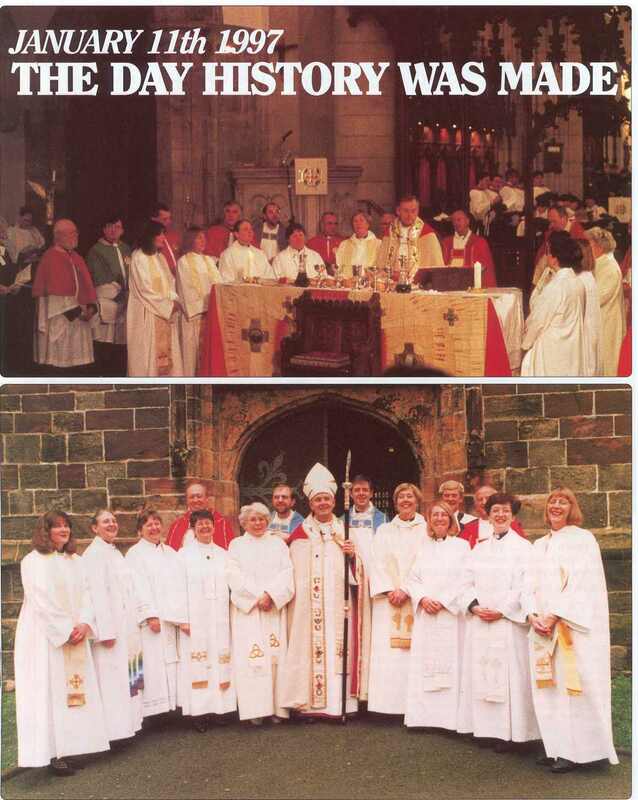 Sadly, that pioneer spirit seemed to have been lost over the years, and on April 6th 1994, only weeks after the first women had been ordained to the priesthood in the Church of England, the Bill to ordain women to the priesthood in Wales was defeated in the Church’s Governing Body by a narrow margin in the House of Clergy, having been passed overwhelmingly by the laity and unanimously by the Bishops. What no-one could have foreseen was the upset this would cause throughout Wales, both inside the church and far beyond. It was headline news for days on Welsh TV and radio and in Welsh newspapers. Letters of protest poured in to the Bishops’ offices. Within a couple of weeks a meeting was held in my own parish in Mid-Wales, at which Anglicans from all over Wales decided to set up a campaigning organisation called Women Priests for Wales, of which I somehow found myself the Secretary! Things moved rapidly after that, and only a couple of weeks later I was being interviewed live by Jenni Murray on the BBC radio programme Woman’s Hour. This was the beginning of two and a half years of very hard work, over and above my full-time work as a librarian and my parish responsibilities. Meetings were held and a petition organised, which garnered thousands of signatures and was presented to the Bishops. People (lay and clergy) joined, wore badges, wrote letters and produced publications, raised funds, held vigils and services and prayed hard, and simply refused to let the issue fade into obscurity. Supporters of the campaign (including me) stood for election to the Church’s Governing Body and took part in its debates for the next few years. 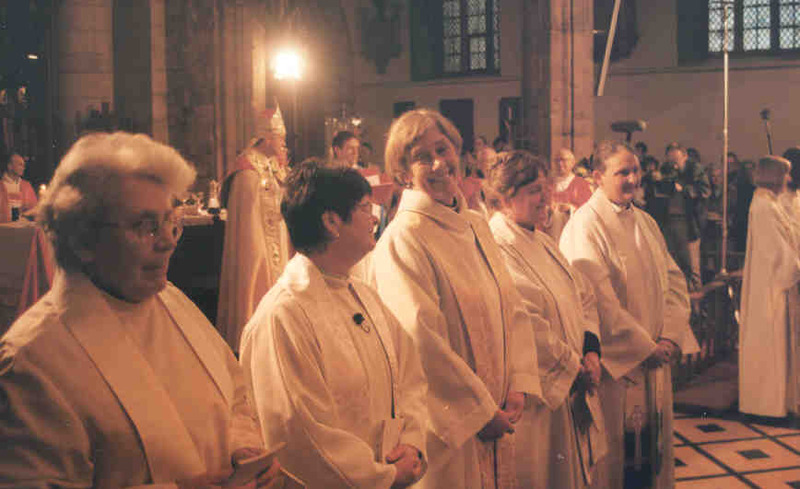 Finally, on September 19th 1996 (the date is engraved on my heart) the reintroduced Bill to allow the ordination of women to the priesthood passed its third and final reading in all three houses and the way was finally open. 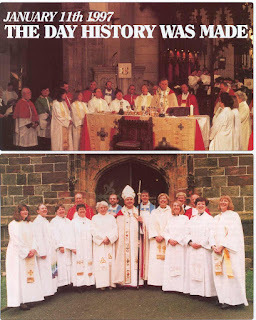 By the time I and my eight fellow deacons (our ages ranging from 27 to 68) entered Bangor Cathedral on that historic morning, we had been waiting for that day for between 2 and 14 years. In my case I was 50 and had been a deacon for eight and a half years. Now, at last, the vocation we had all been aware of for so long was to be fulfilled and I cannot find the words to describe just how that felt. Perhaps the expressions on our faces in the photographs taken during and after the service say it all for us, without the need for words. As if the ordination day itself were not gift enough, the next day found us all back in our home parishes, presiding for the first time at the church’s central service, the Eucharist or Holy Communion. My vicar had cancelled the other morning services, so that my first Eucharist could be a joint celebration for the congregations from both our churches. The church was full and the atmosphere almost electric with excitement and joy. 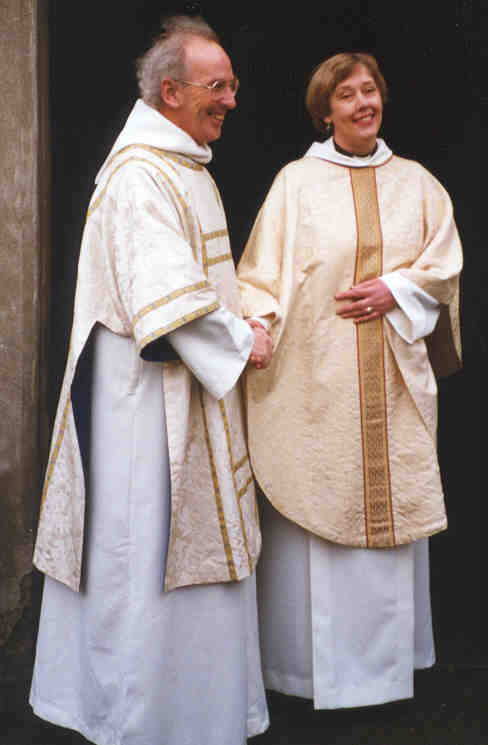 I had been allowed to chose the hymns and songs, and the vicar, vested that day as a deacon to assist me, as I for so long had assisted him, preached for me. It sounds like the most hackneyed of clichés, but I truly can remember just about every detail of that morning, even to the butterflies in my stomach as I sang the priest’s part of the service for the very first time. There were so many communicants that administering communion took much longer than usual, and the music group had time to sing all the songs I had so happily chosen. After the service came the photographs and then the party in the adjacent church hall. 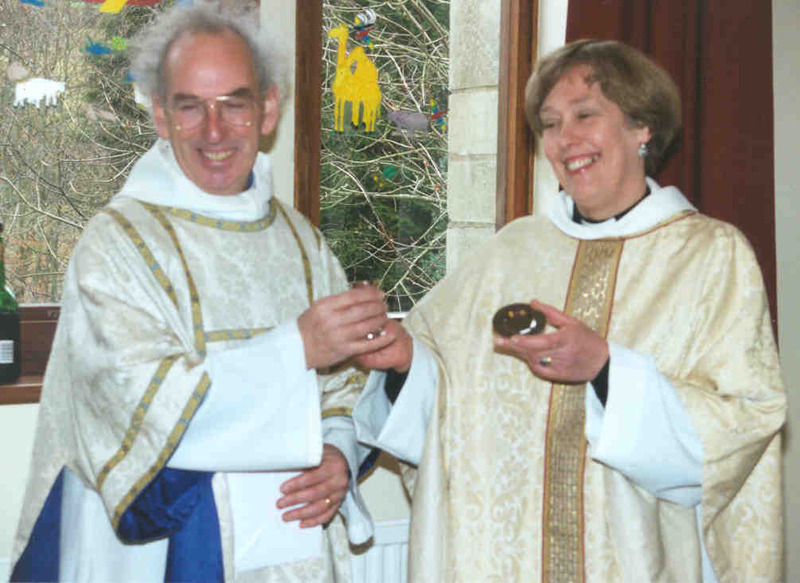 A parishioner who is a gifted cake-maker had made and decorated the most beautiful ordination cake, and cake and wine circulated merrily for some time, amid animated conversation and much laughter. Then, for me, came the crowning moment when my broadly-smiling vicar presented me with the beautiful silver home-communion set which was the parishes’ gift to me to mark the occasion. It has had much use over the years since then and I treasure it still, both as a reminder of an unforgettable weekend and as a tangible sign of the loving friendship which supported and encouraged me though all the years of my ministry in those parishes. It is the most immense privilege to be a priest, and I thank God for that privilege and the deep and abiding joy it has brought me. ﻿This post is dedicated to the memory of Alistair (died November 2011) good friend and staunch supporter of the ordination of women, who sat next to me throughout that crucial debate and unprotestingly allowed me to crush his fingers, as we waited on tenterhooks for the result of the vote. 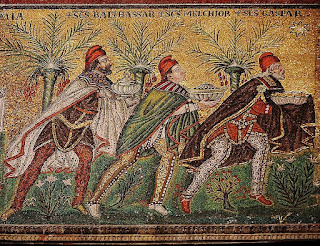 Tonight is of course Twelfth Night, the beginning of the twelfth and final day of Christmas, and tomorrow the Christian church will be celebrating the great feast of the Epiphany. However, for the Transit household tomorrow is also a day of family celebration, as my next-to-youngest sister and Grandson #3 both have birthdays on this special day. Indeed I’ve recently learned that DD’s mother-in-law was also an Epiphany baby, so it’s a triple for us. 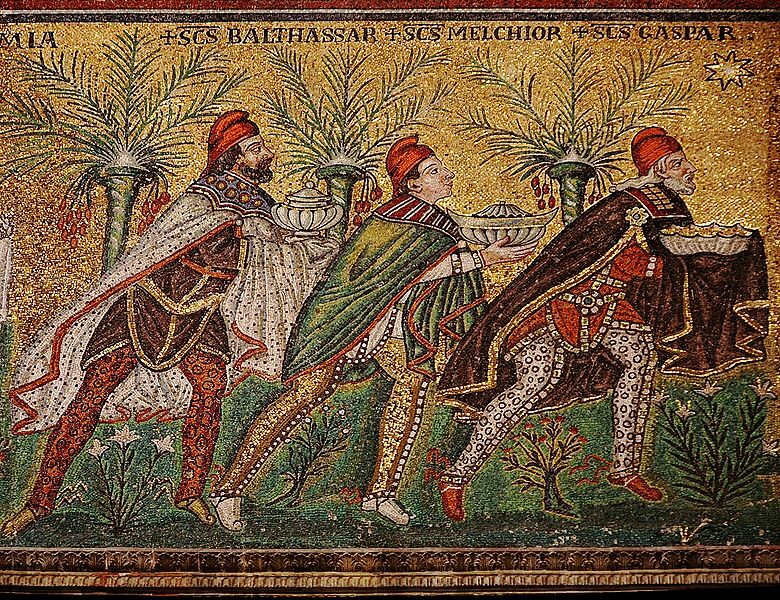 This is the reason why our family has always defied tradition and left the Christmas decorations up until after Epiphany. It just seems so mean to take them down the day before and leave the house drab and ordinary for their birthday. Well, that’s my excuse for enjoying a few more days of colourful Christmas cards, flying angels and our lovely little African crib set. DH is now enquiring plaintively when supper will be, so I will leave you for now with what to me is one of the most beautiful of Epiphany carols. Back at the beginning of November, I and many other bloggers started to experience huge difficulty in following new blogs or ceasing to follow others. The problem featured largely in Blogger’s Help Forum for weeks, and a fix was repeatedly promised, but doesn't yet appear to have materialised. Until shortly before Christmas this was my situation too, until I accidentally stumbled upon a solution to the problem of followed blogs failing to appear in Google Reader. My fix doesn’t cure the problem of your list of Blogs I’m Following being inaccurate, both on your dashboard or in your profile, but it does mean that ALL the blogs you follow, including newly added ones, will reliably appear whenever you go into Google Reader to view new posts. 1. Go to the blog concerned, and in Google Friend Connect, stop following the blog. click the little box below, labelled Done. It’s such a small box that it’s very easy to overlook, and even when you see it, if you’re like me you may think it’s a statement, rather than something requiring action. However, I now know from experience that if you click on this little box every time you begin to follow a new blog, you will always, and I do mean always, get its new posts appearing in Google Reader, even when, as often happens, they don’t show up in your list of Blogs I’m Following. In your list of subscriptions on the left of the page in Google Reader you will find that your followed blogs will now be divided into two sections, with the blogs you followed before the problem arose appearing at the top, and a second list of more recently followed blogs underneath. A bit of a nuisance, but I can promise you that they won’t disappear from there and you won’t miss any more new posts from your favourite blogs.